A History of Fanelli's Cafe . . . The land that would become present day SoHo (from Canal Street north to Houston Street; from West Broadway to Crosby Street) was marsh and forest land until the Dutch began establishing farms in the area in the 1640s. The first farms were owned by freed slaves. In fact, in 1663 the Cafe was a farm owned by Domingo Angelo, a freed slave. The Dutch West India Company had a policy of freeing slaves and granting them farms on New Amsterdam's outskirts. This practice was not altruistic in nature. Slaves were freed and given farmland in order to construct buffer zones to protect the settlement against Indian attacks. In 1697 the block bounded by Prince, Spring, Mercer, and Greene Streets (on which Fanelli's is located was deeded to Nicholas Bayard (1644-1707) by the British colonial government and became part of his farm. The English had taken over New Amsterdam from the Dutch in 1664 and renamed it New York. Prince Street was laid out and named by 1797. The namesake of the street is unknown. Mercer Street, originally called Clermont Street, was laid out prior to 1797 and renamed in 1799 for General Hugh Mercer, an American soldier killed in the battle of Princeton in 1977. Incidentally, Greene Street, one block away, is named after General Nathanael Greene also a veteran of the battle. Throughout the 18th century this area remained mostaly farmland, but in 1809 Broadway was paved north to Astor Place and the district slowly took on a residential character. In the 1850s and 60s, the residential makeup of the area changed. Broadway from Canal to Houston, became the site of many fashionable hotels such as the famous St. Nicholas, and expensive stores including Tiffany and Lord and Taylor. At the same time Mercer and Price Streets between Canal and Houston became lined with expensive brothels. After 1870 the stylish hotels, stores, and brothels gradually moved uptown. Then wholesale trade establishments took over the area and constructed the cast iron warehouses that dominate the present day SoHo. 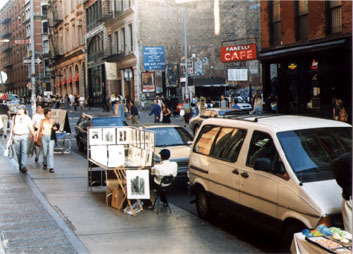 The acronym SoHo means: south of Houston Street. In 1845, Bayard heirs sold lots 20 and 21 at the corner of Prince and Mercer Street to John Hance. A corner building first appears in the New York city tax assessment records in 1846 - with a 94 Prince Street address. The 1853 Perris Insurance Map shows a wooden structure on this site with a store "underneath". In addition, the map shows a brick building on the adjoining lot with a Mercer Street address. A building formerly on this lot was replaced with the current brick one in 1853. The New York City Building Department came into existence in 1866. As a result, there are no surviving plans for these buildings before that date. Herman Gerken leased the wooden building at 94 Prince Street in 1847 and became the proprietor of a grocery on the site. In 1853 Hance's heirs, Edna Brown, Mary Sarles, and Sara McIntosh, sold the lots to Herman Gerken. In 1857 Gerken built the present day handsome five story brick building that still carries the 94 Prince Street address. This corner building was interconnected with his adjourning building at 135 Mercer Street by at least 1891. The 1857 Perris Insurance Map shows a five story stone or brick building at 94 Prince Street with a "store underneath." The brick Mercer Street building (number 135) had been built by Gerken in 1883-54. This building was numbered 111 Mercer before 1877 and is the attached back building that now contains the kitchen for the cafe. This building was a residential structure through much of its history. The suspicion arises that it must have been used as a brothel since Mercer Street was lined on its west side, almost solidly by brothels during the 1850s and 1860s. There had been a temporary building on this site (111 Mercer) in 1850-51. The street directories for this period describe the borders as Hannah Baggot (col'd - a black person) washer, Mary Sophel and Henry Moke - no other information was given. The 1856, 1857, 1858 Wilson's Business Directories describe a "Julia (Col'd) Boarding House, 111 Mercer Street." The 1870 census describes 3 families and 1 individual living in 94 Prince Street for a total of 10 individuals in 111 Mercer. The 1880 federal census apparently treated the two buildings as one. This census describes five families with a total of 24 individuals in 94 Prince Street. New York city carried out one for this year but only counted heads in election districts and 135 Mercer Street and 94 Prince Street could not be located. Neither of these addresses appears in the 1900 census. This suggests that both buildings were only used as business establishments at this time. The 1850 Federal Census describes Herman Gerken: age 34, born in Germany; Grocer. Anna Gerken, his wife: age 29, born in Germany. Children: Gath age 5, Henry age 4, Mary age 2. The children were born in New York city. This census does not list addresses but Doggett's 1850 New York Street Directory puts Gerken at 94 Prince Street. Gerken died in 1860 but his heirs kept the property well into the 20th century. The Gerken's do not appear in any subsequent federal or state census living at this address. 94 Prince Street is described in the directories as a grocery from 1847 to 1863 in both buildings. During much of the 19th century, alcoholic beverages were staple items for sale in grocery stores - and still are. Corner groceries largely evolved in Lower Manhattan into liquor stores or corner saloons. The New York city Board of excise issued tavern licenses to groceries through much of the century. In fact, newspaper advertisements for Manhattan groceries in the mid-19th century were often illustrated with pictures of kegs of liquor. In 1864 and 1865, 94 Prince is listed as a Porter House, then in 1866, it is listed as a grocery and in 1867 it reverts back to a liquor establishment. The famous 19th century diarist George Templeton Strong in 1865 described a friend, living in the Grammercy Park area, as having gone "to the nearest grocery and swallowed two or three glasses of whiskey, one after another." In addition to selling food and beverages the building owners rented apartments and light manufacturing space. A large hoistwheel on the top floor bears witness to this activity. In 1871 and 1872, the city directories tell us that Schmidlin and Driscoll made "Lamps and Reflections" upstairs from the cafe and then moved farther north on Mercer Street. Unfortunately the business directories are silent about this address in other years. An 1891 New York City Buildings Department document describes the building as occupied by "Flowers and feathers front building 94 Prince, rear building dwelling." Also in 1893 an application for alterations was submitted to the Buildings Department describes 94 Prince Street as "1st floor saloon and upper floors manufacturing flowers and feathers." After 1863, a number of individuals leased or rented the first floor of 94 Prince Street to use as a saloon, porter house, or just "liquors" or "beer". Charles Bullard sold beer and liquors here from 1863 to 1865. He was followed by George and Mary Hillen who dispensed wines and liquors until 1870. The Hillens were succeeded by Henry Behrens who tended bar until 1876. Then Herman Heinecke wold wines and liquors for just one year in 1877.
which began in 1920 and ended in 1933. In 1878 Nicholas Gerdes arrived and ran his saloon until 1902. He inscribed his name on the transom over the front door and his saloon licenses decorate the dining room wall. Gerdes was followed by Charles Hirschbein who stayed until 1905. From this date until 1922 Harry Green and his family ran the Price Cafe on the premises. In 1922 Michael Fanelli arrived and christened the cafe with its current name. The Fanelli family sold the business to the current owner, Hans Noe, in 1982. Fanelli's operated as a speakeasy during prohibition which began in 1920 and ended in 1933. We have the Fanelli family's word for this plus the remembrances of former patrons. Interestingly the 1925 city directory lists 94 Prince Street as a saloon. Prohibition had arrived in 1920 and the sale of alcoholic beverages was severely curtailed. However, most neighborhood saloons continued as speakeasies. They made beer and wine in their basement or bought liquors from bootleggers. Typically, they would remove any signs advertising alcoholic beverages and replace them with advertising promoting the sale of cider, soft drinks, or food, but regular customers could get the real thing. There was little danger of the small saloon getting closed. Enforcing Prohibition was a federal activity with an understaffed Prohibition Bureau and poorly paid agents. These agents, concentrated on raiding the popular midtown speakeasies that would produce newspaper headlines. In addition, graft on the part of the agents was notorious. The New York City Police Department did not make reporting neighborhood saloons a priority item, indeed they were good places to get a free cold beer on a hot summer night. The Bridge Cafe dates from 1794. Pete's Tavern dates from 1851 and McSorley's Ale House from 1862. All other material © Copyright 2015 New York Art World ®. All Rights Reserved.